Many of you will already be familiar with Shiro Nakajima’s custom work. For those who don’t know he established the highly regarded Ritmo-Sereno back in 2001. Having recently resigned as the head of Ritmo-Sereno (February 2014) he has just started a new shop called 46Works (April 2014). Before we get to the business end with this 1970 Moto Guzzi Ambassador 750 custom lets here about the new venture. 46Works is located on the southern foot of Mt Yatsugatake, Japan. The mountain backdrop creates the perfect atmosphere for creative inspiration, the air is dry, there is little rain and it is quiet. And it is only one and a half hours to Toyko. Shiro tells us it is the perfect location for him. Shiro lives with his wife and 2 children and at the moment he works alone, although he may recruit others in the future. Whilst he mainly works on the maintenance and fabrication of custom motorcycles he also fabricates machine parts for classic cars and produces original furniture. “He graduated from the engineering department in college, and he also has many experiences in participating in vintage road racing and twin road racing, so that he is skilful at the motorcycle production based on both theory and practice”. Now down to the feature of the day ” To begin with the build the stock Moto Guzzi Ambassador 750 was stripped down to the engine. 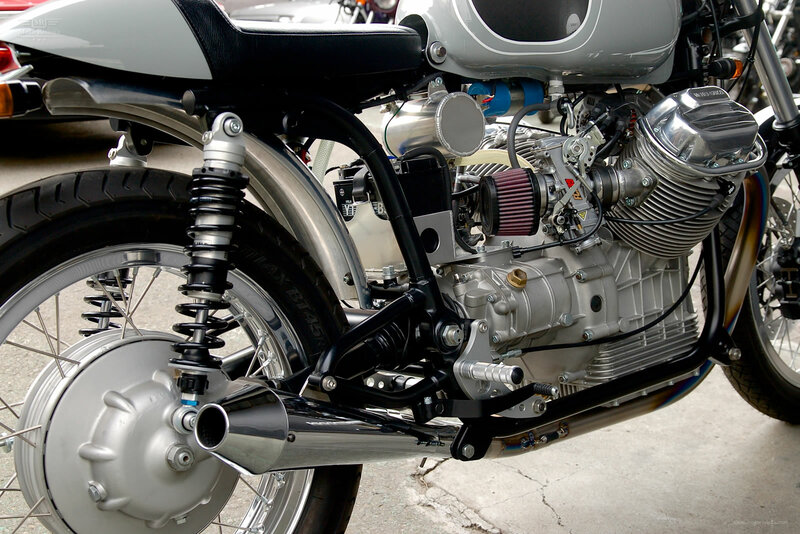 The stock engine was completely overhauled and features Big bore/short stroke, light weight aluminum flywheel, 5 speed transmission and carburetor from FCR. 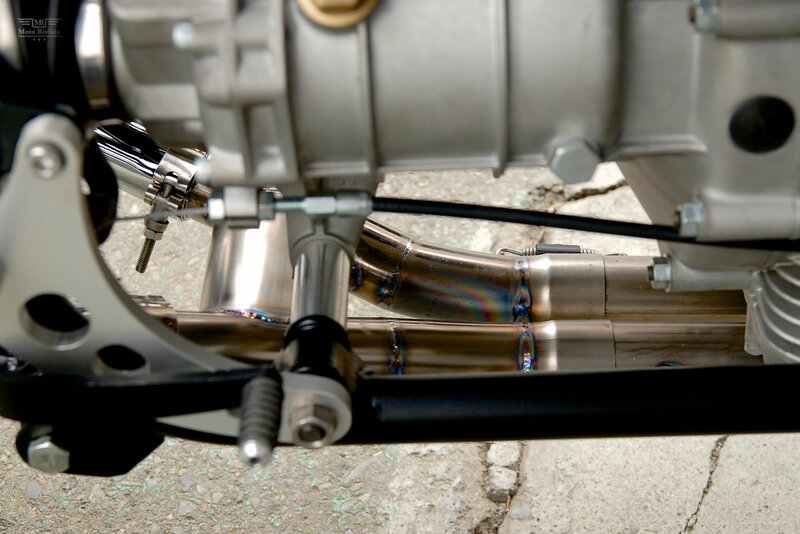 The titanium exhaust system was hand fabricated by Shiro. At the front this Moto Guzzi Ambassador 750 custom features 41mm front fork with EXCEL aluminum H rim, 296mm disk brake disk and Brembo caliper. The fuel tank was chopped and modified to adapt the new look and features a Newton tank cap made by AMP Bates. 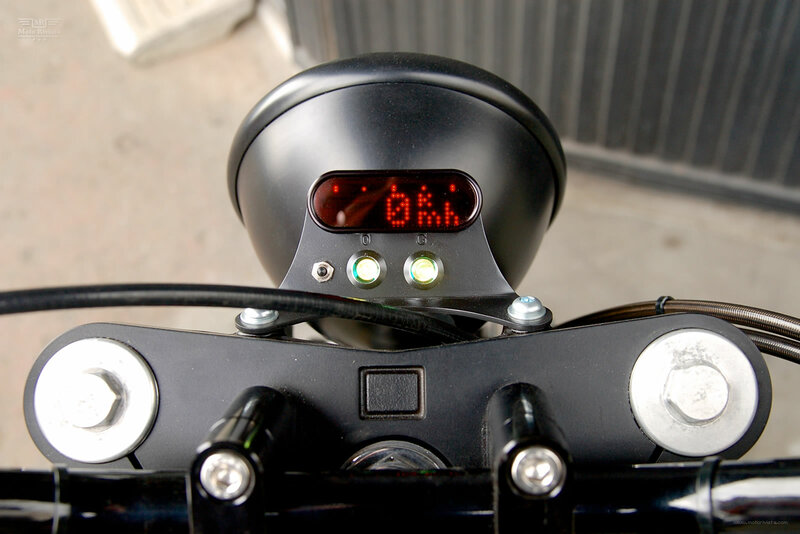 The speedo meter is from Moto Gadget while the rear shock absorber is from Öhlins. 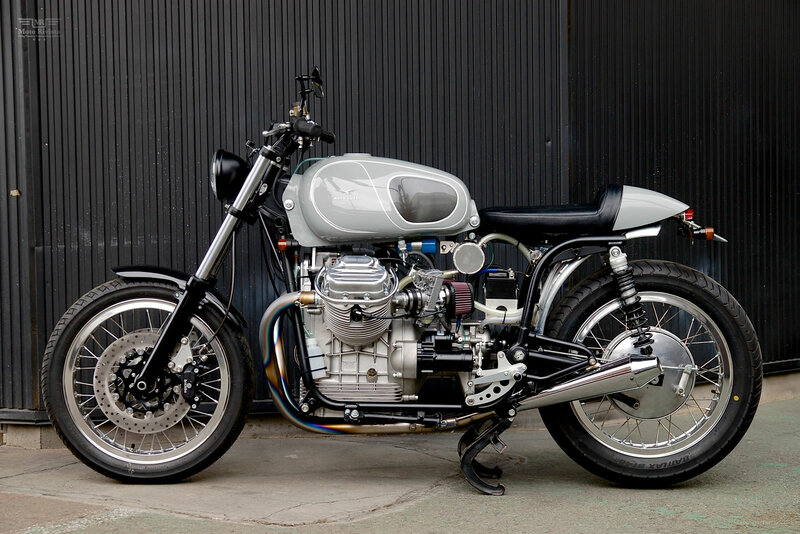 One thing I would like to make very clear, this Moto Guzzi Ambassador 750 is not just some show pony average customization, this bike has been modified beyond my understanding. Today I don’t think understanding Japanese was my only limitation, I am also baffled with the level of craftsmanship on this bike! 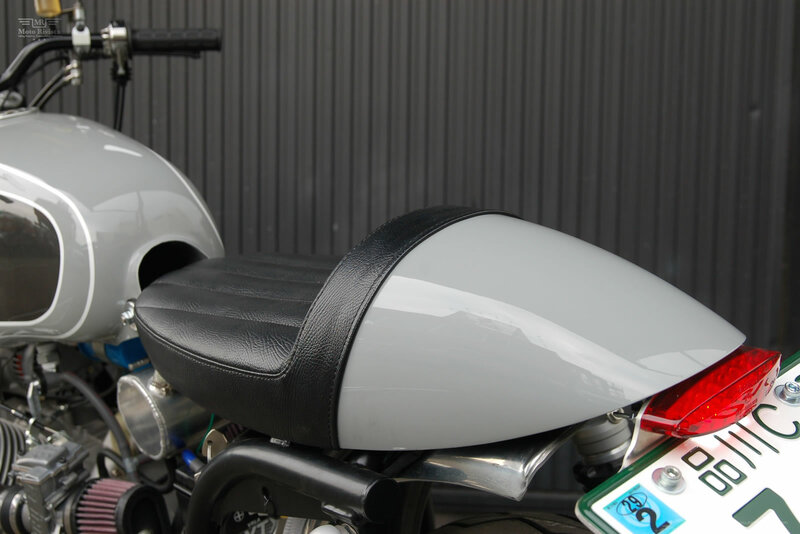 Many exciting things are happening already for 46Works including the R nineT Custom Project. Shiro Nakajima along with Hideya Togashi (Hide Motorcycle), Go Takamine (Brat Style) and Kaichiro Hurosu (Cherry’s Company) have all been selected to participate in the BMW Motorrad R nineT Custom Project. Each is free to customize a BMW Motorrad R nineT as they wish. We will be closely following this project to see what the four chosen customizers come up with and will post updates as we get them. 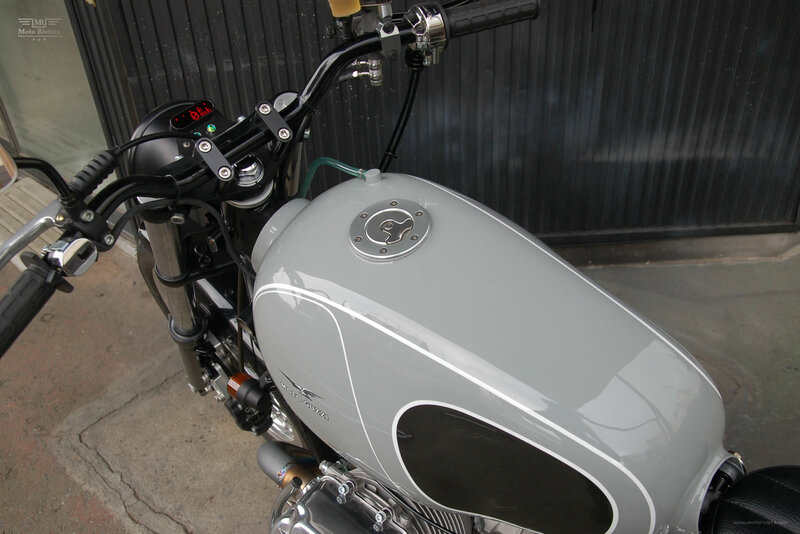 In the mean time check out this video ~ R nineT Custom Project Chapter 1. Show Shiro Nakajima and 46Works some support and like his new facebook page.